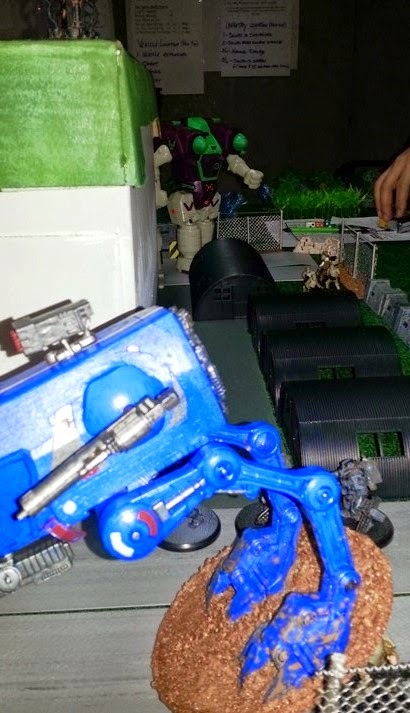 My group's first foray into 28mm BattleTech gaming happened on 2/12/15. 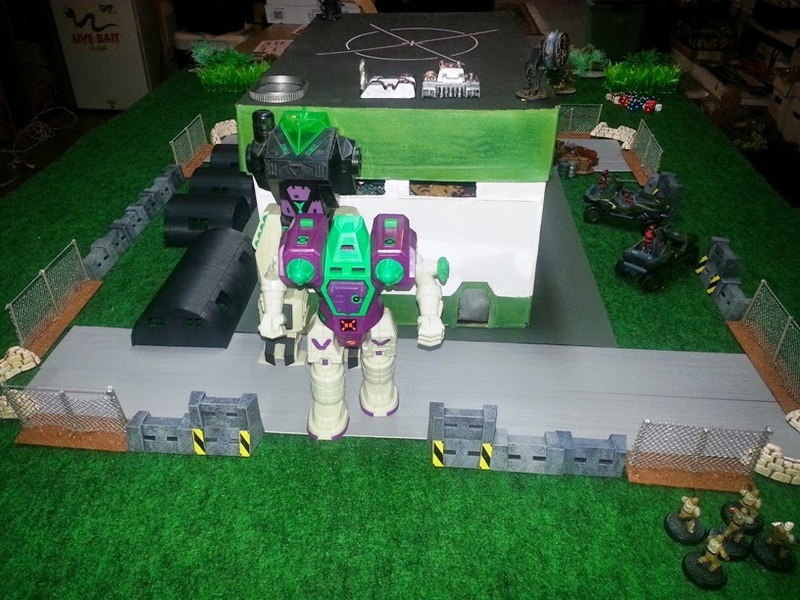 I had secretly been collecting mechs and building terrain to use for the game. 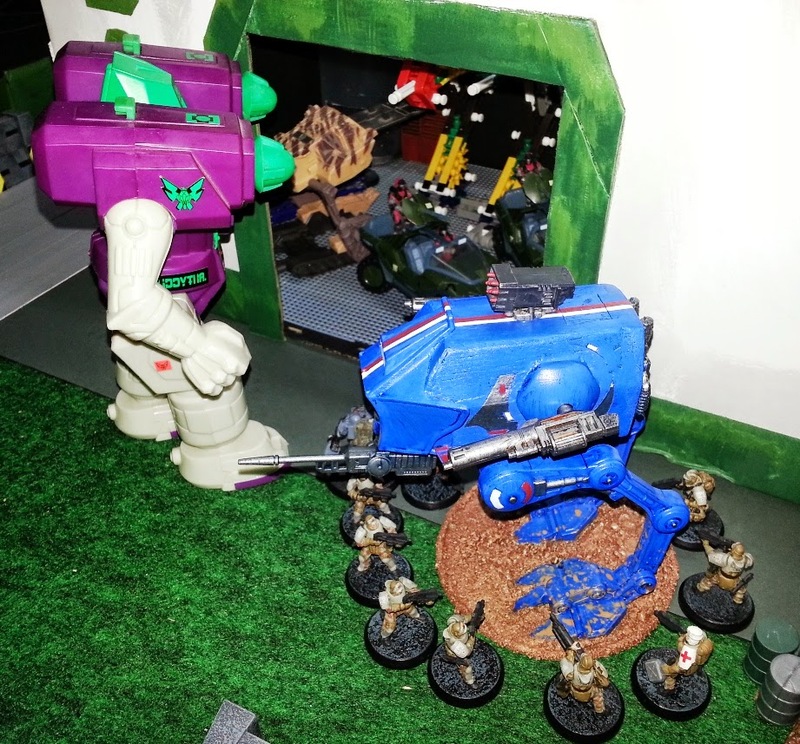 I'd decided fairly early on that I wanted to play a game set during the Clans invasion of the Inner Sphere and focused my energies on that time period. I can't express how hard it is to keep a secret from my gaming group! Pandora. 3052. Clan Jade Falcon, in a massive assault resulting in the death of thousands and cities turned to ash, attempts to wrest control of this lush jungle planet from the Federated Commonwealth. Standing in their way is the Gray Death Legion. Outnumbered and outgunned, the GDL relies on their knowledge of the terrain and a new weapon, power armor, to stem the Falcon tide. Will the GDL be successful in stalling Clan Jade Falcon’s advance, or will it get swept under their emerald talons? With a toehold on the planet, Clan Jade Falcon is attempting to establish several field repair facilities in key locations. Behind Falcon lines, these facilities are made to service damaged Mechs, resupply all Clan combat units and provide rear-echelon R&R rotations for infantry units. After the GDL’s successful defensive deployment of their new battle armor against the Falcons near Vandmaal, High Command wants to see how they operate in an offensive capacity. For you, this means that there’s a Mech repair facility within striking distance and you’ve been given some power armor to “play with”. 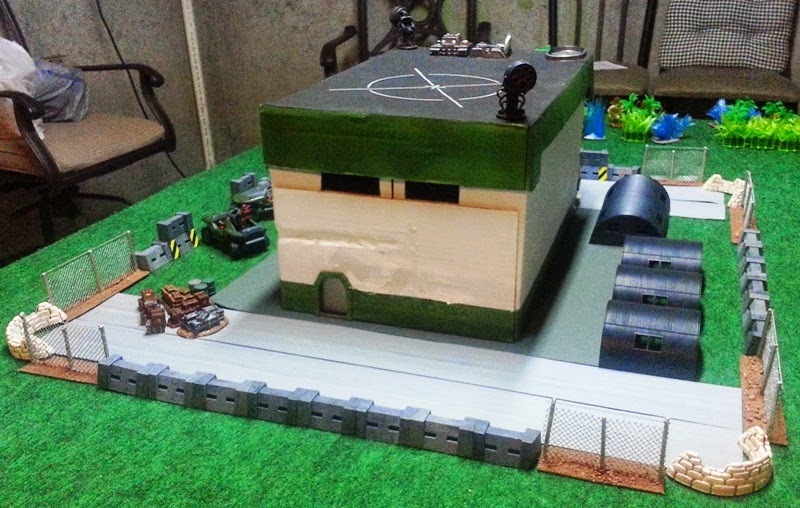 Since the facility is behind enemy lines, it’s a gamble for the GDL’s defense of Pandora. Lost units will be unsalvageable. Pull off the raid and High Command will handsomely reward your efforts. Fail and you’ll most likely be too dead to worry about it. 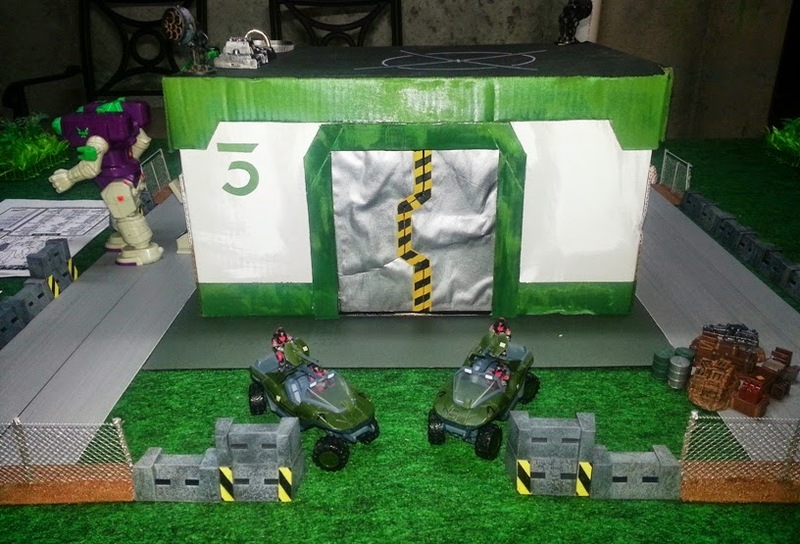 Intel reports the facility is garrisoned by Clan anti-infantry units and technician noncombatants. There are also sketchy reports of a possible ‘live’ Mech being stored at the facility. You’ve been given a Flea to handle the Clan infantry. The power armor is for destroying any Mechs being serviced and recovering any ‘lostech’ intel that may be present (or as the GDL High Command calls it, “foundtech”). Crippling the Falcons is the main goal…how you achieve it is up to you. There is a lot of canon in the plot, so it was a totally plausible encounter. 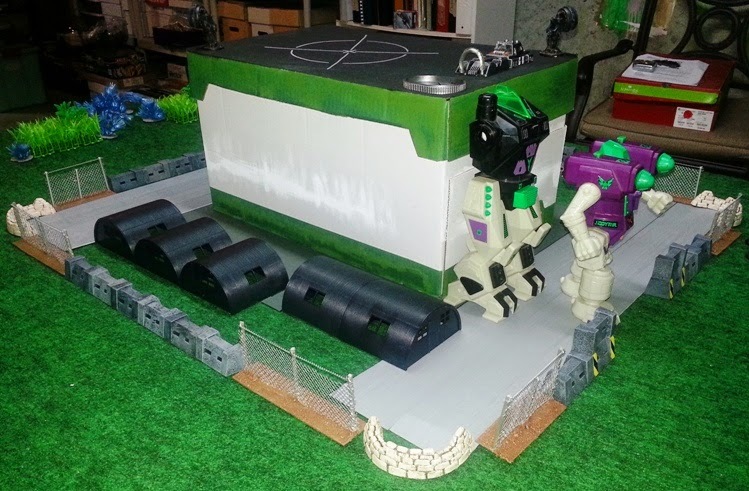 I built the repair facility from a copier paper box, built chain link fencing and painted the Flea in Federated Suns colors (it was originally an open-cockpit, action figure-sized Star Wars vehicle I heavily converted ). 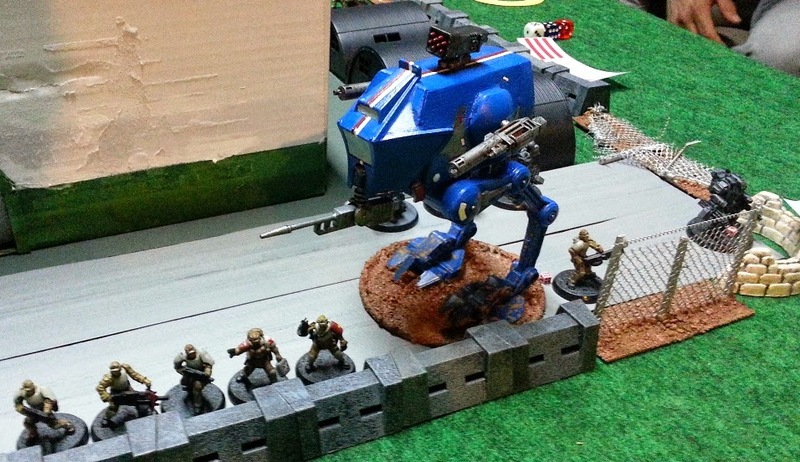 As for the minis, I used AT-43 UNA TACArms as GDL powered armor and Red Blok infantry for Clan forces. The jeeps are Warthogs from the HaloClix miniatures line. The Hunchback IIC is from the 1990's Tyco toy line. The following photos were taken by scout forces of the facility. It's a good thing that Pandora is a jungle planet. Intel was easily attained. *1 – GDL reserves are called in after the 5th turn, as needed. They come in from the same board edge as the original assault force. Note that only ½ of the platoon can ride in/on the APC. One additional squad can ride on the tank. The final squad has to ‘slog it’. *2 – Clan infantry reserves are the off-duty units resting in the Quonset huts. They will not be alerted to danger until the first gunfire is heard. They will form (i.e., walk outside their huts) in groups of 5 on a roll of ‘6’ the 1st turn after alerted. This is a descending check. Alert +2 will be 5+, alert +3 = 4+, etc. 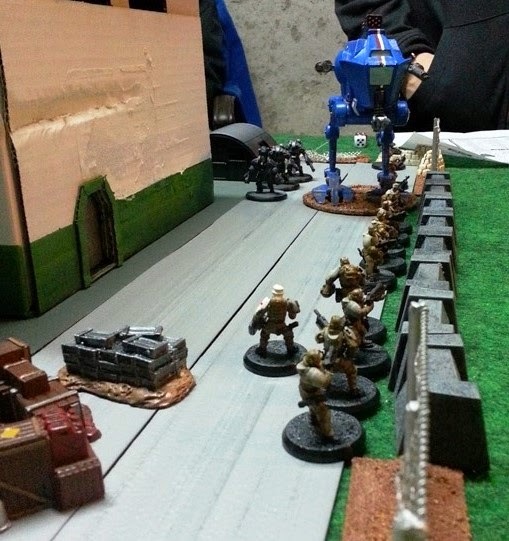 The GDL forces opted to attack the rear left corner of the compound, letting the Flea blow through some fencing and allowing a unit of power armor to trail in its wake. The other power armor unit was deployed on the compound's left side and would eventually see some heavy hand-to-hand combat. The first Falcon squad was decimated quickly from combined mech and power armor fire. The second squad felt the burn of the Flea's flamer, taking further casualties. The GDL forces were smart. Knowing the Flea was solely an anti-infantry mech, they had entered on the opposite side of the Hunchback. The Hunchback's Auto-Cannons could feasibly punch through the Flea's thin armor, thereby eliminating a huge threat to the Falcons. The Hunchback's only problem was its speed. It had jump jets, but was still a slow-moving mech. By the time it had rounded the rear corner of the plant, the Flea was halfway to the front of the facility. Some nimble maneuvering and several turns later, the scrum ended at the front doors. Infantry had disabled the Flea's flamer and it had shot its single-use rockets at the Hunchback (and missed). That left its two machine gun arrays to whittle away at both men and mech. Meanwhile, the Hunchback focused on assisting the two jeeps in taking out the power armor units that had infiltrated the repair facility. It was a bloody mess in there! 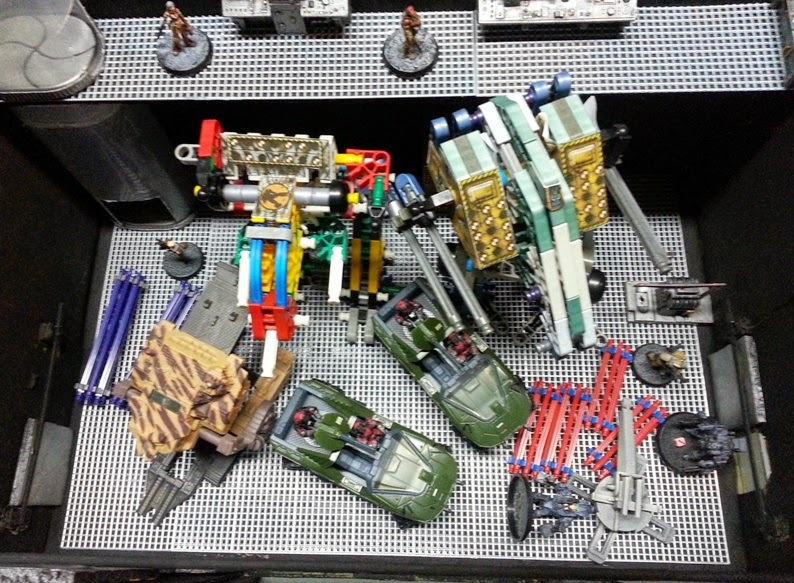 GM's Note - The inside of the facility featured two K'Nex mechs, a Vulture and a Firefly, as well as 'repair equipment'. For this scenario, the K'Nex models were considered the internal "skeletons" of the mechs and thus under repair. In the rear of the facility was a lift tube leading to both a platform and the roof. On the platform were technicians and the computer banks with valuable intel. At the end of the night, the Falcons had lost a couple of infantry squads, but were still holding their own. The Hunchback never did fire its Auto Cannons, but was still inflicting damage on the GDL's power armor. On the other hand, the GDL was standing toe-to-toe with the Falcons. The Flea was using its machine guns to good effect, but was surrounded by infantry bent on its destruction. Overall total: A draw. We simply ran out of time. I think I put too many objectives into the scenario, which led to none of them being achieved. Still, we had fun. That's the important thing. We were also putting the rules through their paces to see how they fared. While they weren't too bad, there was definitely room for improvement, especially concerning infantry and vehicles. Next up? Adjusting the rules and getting all the club's mechs statted for future games.